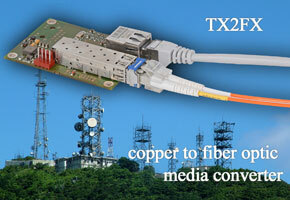 MPL launches with the TX2FX a new Ethernet Media Converter family that performs copper-to-fiber conversion. The TX2FX is a Ethernet media converter that translates transmission signals from a twisted-pair 10/100/1000BASE-TX cable to a 100BASE-FX or 1000BASE-X fiber optic cable. It expands network data transmission distances beyond the 100 meter limitation of copper wire to over ten kilometers by using singlemode fiber optic cable.